Just like that, all of the anxiousness was replaced with feelings of accomplishment and excitement. I immediately ran outside of the baseball locker room to let my parents know that my 4 years of hard work had paid off. I had finally decided to open the e-mail that held the decision Syracuse University had made on my application. The email confirmed that I’d been accepted to the S.I. Newhouse School of Public Communications at Syracuse University. I knew immediately that Syracuse was the University that I was going to attend. I had fallen in love with school after encountering the legendary school spirit while on a tour the previous summer. Two months into the school year, I’m certain that becoming an Orange was one of the best decisions I’ve made. When school first started, I thought I would be a Broadcast or Print Journalism major, but I’ve found myself drawn to Advertising, having been exposed to the field in classes. I recently declared Advertising as my major, but that could change, possibly multiple times, as it is very easy to switch majors at Syracuse. Moving all the way across the country has been a huge learning experience and change in my life. Now that I am 2,700 miles from my parents, I am totally independent when it comes to my day-to-day existence. Being self-reliant has allowed me to step outside my box and try new foods and activities, and to experiment with conducting my life in different ways. Time management is huge in college. Although hanging out in your friend’s dorm until 2am talking about how the Syracuse 2-3 defense seems like fun, studying for your Sociology mid-term is significantly more important. I have fallen in love with both the people and the area of central New York. Everyone I’ve encountered at the University and in town is really friendly and helpful. There is much to do at the ‘Cuse from activities on campus and downtown Syracuse, to walking down Marshall street, the main strip for food that stays open until 2am, so boredom is not an issue. I know what you are thinking: “Isn’t Syracuse really cold?” Yes, yes it is. In fact it has the highest per capita rate of snowfall in the country. But a warm jacket makes all the difference. One might think that this means that there are a lot of snow days, but Syracuse doesn’t have those too often. The last time classes were cancelled because of weather was 1998 (that is until very recently when they were cancelled because of Hurricane Sandy, but that is another story). Dublin High School has definitely prepared me for all of the changes and challenges I’ve faced starting college. I’m not going to say that Dublin High School classes are harder than college courses, but the rigor of the AP programs at Dublin High definitely equipped me to take on college classes. Also, with 19 AP credits Syracuse accepted, I will be considered a sophomore by next semester and on track to graduate a semester early (but why would I want to do that?). Dublin High School prepared me for life outside of college academics as well. I joined my Executive Board for my dorm where we organize events and activities for everybody in the hall. My experience in Mr. Tim Sbranti’s Leadership class has been very helpful with this. I also made the Syracuse Club Baseball team. 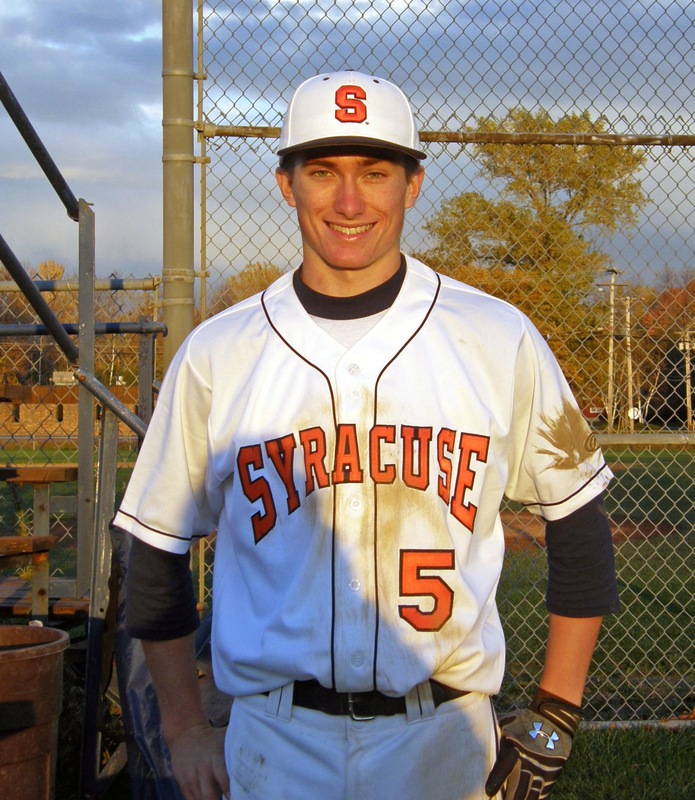 Syracuse does not have a university sanctioned baseball team, so the Club team is very competitive and I was thrilled to be one of 12 players selected out of a field of over 60 who tried out. The team has traveled to UMass and Penn State to play in tournaments as part of the National Club Baseball Association. Club sports are a great option for anyone looking to keep playing their sport competitively once they go to college. Syracuse University gave me the opportunity to get involved in the media right away. I currently help to produce the televised pre-game show for Syracuse sports, and the radio post-game show on our local NPR station. I have learned so much by immersing myself in these activities, plus I love the excitement of putting together a product that many people have an interest in, since sports are HUGE at ‘Cuse. Even though I may never work in these fields, I like learning about them and being involved. 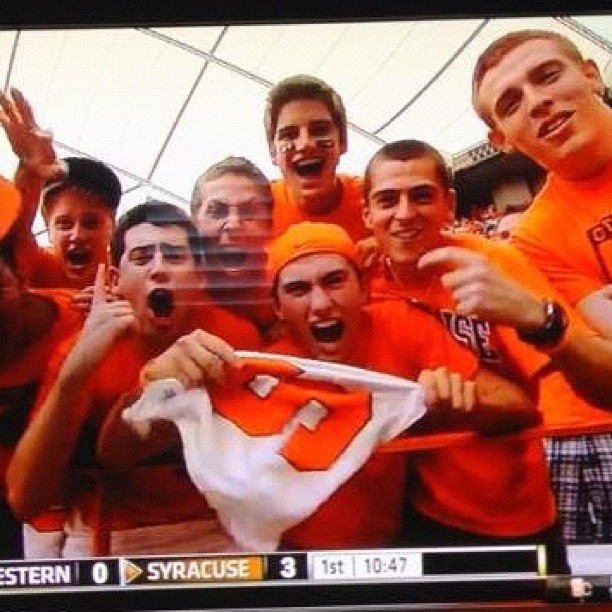 A robust sports scene was a requirement for me in considering colleges and Syracuse easily fits that bill. We have a mediocre football team, the best college basketball team in the NCAA (#9 if you ask anyone outside of Syracuse) and the most successful Lacrosse program in the country. We also, in my opinion, have the best mascot in the country, Otto the Orange! Everyone goes crazy for Syracuse sports and I have fallen in love with them as well, as you can see from this picture. I have already bought season tickets to the basketball games and I look forward to camping out in 20-degree weather in order to get good seats for the Georgetown vs. Syracuse rivalry game. I didn’t expect to feel such a strong connection to my college so quickly, but I already see Syracuse as my second home, a place where I will always be comfortable. I feel the strong sense of community, and the multitude of ways to be involved at Dublin High School are key reasons behind how easily I was able to get immersed in and adjusted to college life. I owe my thanks to Dublin High for providing me with the groundwork for success in college and beyond. 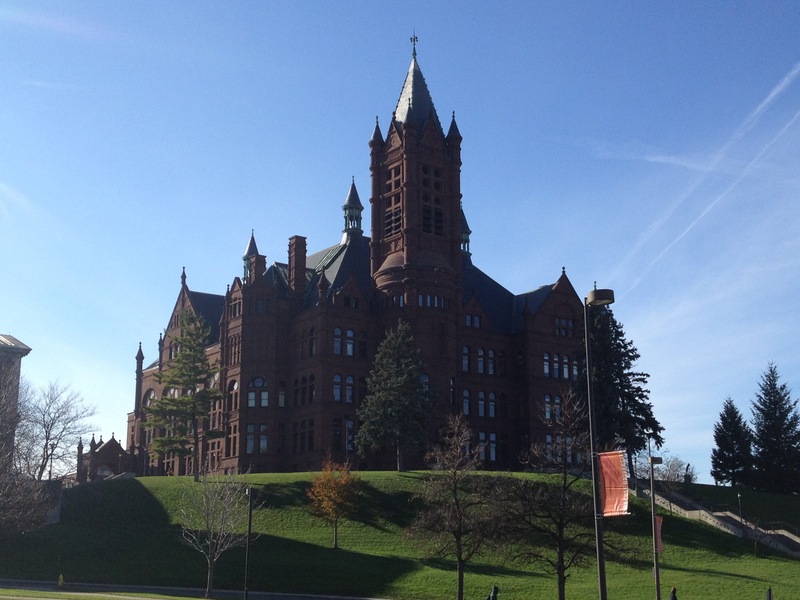 If you have any interest in Syracuse, feel free to e-mail me (cjbulloc@syr.edu). 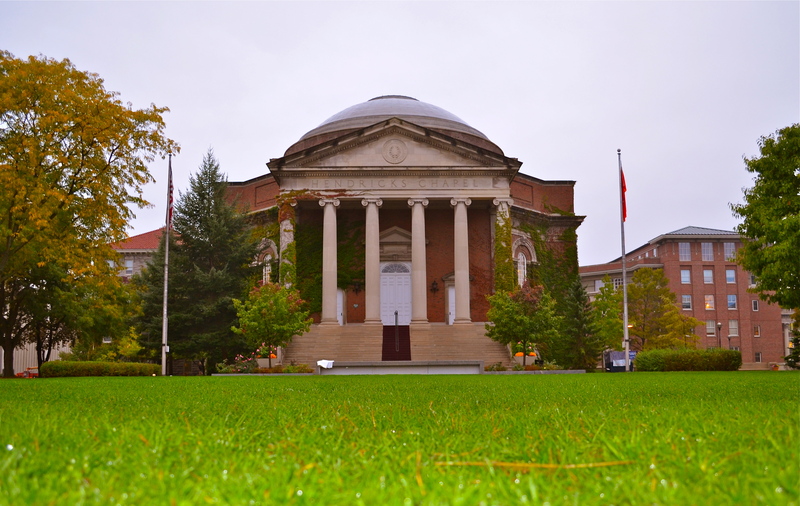 And if you are serious about attending Syracuse, I would encourage you to come see the school when classes are in session in order to get the full feeling of the SU community. Id love to be your tour guide! At the Dublin High School 2012 Senior Awards Night Chandler Bullock was named the Dublin Lions Club Student of the Month (June), was awarded a Dublin High PFSO Scholarship, was named a California Scholarship Federation Life Member, won a President’s Gold Award for Education Excellence and earned Dublin High School’s Advanced Scholar Diploma.. Chandler was also awarded a Syracuse University scholarship.